At a recent high-profile American thoracic surgery conference, one of the speakers presented data from his program showing the safe and effective use of regional and conscious sedation techniques to perform complex thoracic surgery procedures on non-intubated patients. Instead of being greeted with enthusiasm or professional interest, the great majority of well-known giants in thoracic surgery dismissed the idea with a few, repeated sarcastic, albeit joking remarks about the inconvenience of having conscious patients in the operating room. This attitude seemed perplexing given the results of Pompeo et; al.’s (2014) survey of the European Society of Thoracic Surgeons, in which a large number of respondents (59%) reported using nonintubated thoracic surgery (NITS) procedures. These mixed attitudes led thoracics.org to perform an in-depth literature search to determine the state of non-intubated thoracic surgery. What is the current status of non-intubated thoracic surgery (and the literature surrounding it)? Is it a wild, unsustainable idea promoted by a few dynamic but misguided surgeons? Is it a well-researched and promising developing technique that is being rejected by surgeons who may lack vision? Or does it fall into that gray area where we suspect that this technique has real value and benefits for a special subset of patients but there isn’t quite enough high level clinical evidence to demonstrate that to the surgical community? Is non-intubated thoracic surgery destined to fall to the same fate of VATS – a game-changing technique that emerged in the early 1990’s, has been clinically demonstrated to be superior to open surgery with an overwhelming preponderance of evidence, but still being discussed by many surgeons as the ‘new kid on the block’**? Will people still debate the merits of non-intubated surgery ad infinitude thirty years from now, even when clinical guidelines have made it the standard of care (like VATS and oncology surgery)? Will there be the same reluctance to set firm standards for training in these techniques? As it turns out – non-intubated thoracic surgery is not a new idea or concept. It was developed early in the 20th century and was used successfully for many years for even the most complex thoracic cases such as esophagectomies until the development of double lumen intubation in the 1950’s made the use of single lung ventilation possible (Gonzalez-Rivas et. al. 2015, Pompeo 2015, Kiss & Castillo 2015). Since its rediscovery in the last several years, many of the problems that plagued this technique during its inception over a century ago have been addressed through better understanding of human physiology. Now, this seemingly fringe technique has been shown to be a feasible approach for treating the very margins of the thoracic surgery population (the extreme elderly, patients with advanced respiratory disease or other serious medical co-morbidities) that are often deemed inoperable using current techniques. 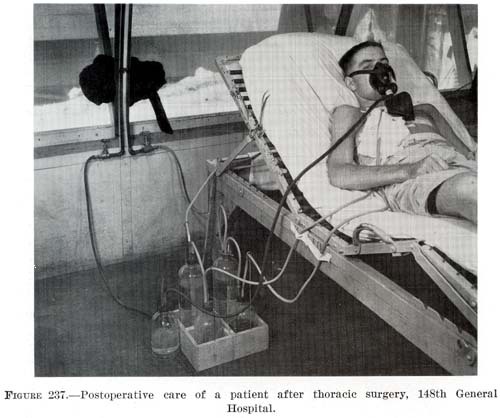 The dreaded complication (spontaneous pneumothorax) of early use of this technique by pioneers in thoracic surgery has now become one of the main advantages. Surgically created pneumothorax results in almost perfect deflation of the operative lung, achieving better results than even the most experienced of anesthesiologists using traditional single lung ventilation. Surprisingly to many observers, instead of creating a ventilatory emergency, this process is readily tolerated by most patients, even those with poor baseline pulmonary function (David, Pompeo, Fabbi & Dauri, 2015). The majority of the current series of research on this topic are being performed by a small group of surgeons which includes Dr. Diego Gonzalez Rivas (Spain), Dr. Eugenio Pompeo and the Awake Thoracic Surgery Research Group in Italy and Dr. Ming-Hui Hung and colleagues (Taiwan). Pompeo’s group (Drs Benedetto Cristino, Augusto Orlandi, Umberto Tarantino, Tiziana Frittelli (General Director of the Policlinico Tor Vergata), Leonardo Palombi, Paola Rogliani, Roberto Massa, Mario Dauri) has been especially prolific in 2015 after several of their works were published in a special issue of Annals of Translational Medicine. In multiple studies, these researchers have reported successful thoracic surgery outcomes in non-intubated patients, thus eliminating the majority of risks related to general anesthesia as well as uni-lung ventilation via mechanical ventilation and intubation. In several of these studies, the authors were also able to successfully perform these surgeries in fully awake patients (versus consciously sedated), making surgery possible for even the frailest of candidates. These studies included a small number of comparisons between traditional and non-intubated surgeries. While the numbers of patients enrolled have been small, and there are few randomized studies, the results have been encouraging. Chen et. al’s 2012 study has been one of the largest studies to date, with 285 cases. In this study, patients underwent lobectomies, wedge resections and segmentectomies with 4.9% requiring conversion with tracheal intubation. Lung resection was undertaken with traditional (3 port) VATS or a needlescopic approach. The authors report the biggest problem they encountered was increased bronchial tone and airway hyper-reactivity during manipulation of the pulmonary hilum during lobectomies and segmentectomies. This was effectively treated without significant alteration in hemodynamics via intrathoracic vagal blockage which eliminated the cough reflex in these patients. The authors caution judicious patient selection to prevent emergent conversion (intubation) particularly while surgeons are initially attempting this technique. Chen et al. also believe that non-intubated thoracic surgery is best suited for petite or small-sized female patients because the small tracheal size of these patients predisposes them to a higher rate of complications and potential tracheal injury with traditional surgery and intubation. Pompeo et. al’s review of the literature surrounding of the use of this technique in patients with severe emphysema undergoing nonresectional lung volume reduction surgery (LVRS by awake anesthesia) showed significant treatment advantages for patients undergoing lung volume reduction surgery without intubation or administration of general anesthesia. With an average mortality of 5% and a morbidity of 59% for traditional lung volume reduction surgery as reported during the National Emphysema Treatment Trial, findings from Tacconi et al.’s 2009 study of 66 LVRS awake patients (matched with 66 patients undergoing traditional surgery) appears promising. The authors report a reduced incidence of prolonged air leaks (18%) versus 40% in the traditional surgical group as well as a decreased length of stay. In this study, 3 patients required conversion to general anesthesia – one patient due to an elevated paCo2 of 83% and the remaining two patients for anxiety attacks. Rate of intubation/ respiratory failure/ mortality in Tacconi et al. Mortality in both non-intubated and the traditional surgical group was the same, with one patient from each group. In both cases, the patients had developed massive airleaks following surgery. In the non-intubated group, the patient developed acute lung injury requiring intubation of POD#12 and died POD#38. In the traditional surgical group, 4 patients were unable to be extubated at the end of the case, with one patient requiring an additional day of mechanical ventilation. Another patient was reintubated on POD#3 for respiratory failure and died on POD#67. Pompeo et. al, over the course of over eleven years, have also investigated the use of non-intubated (and awake) thoracic surgery for a wide variety of cases including urgent /emergent cases, wedge resections, decortications, talc pleurodesis as well as nonintubated anesthesia combined with single (uniportal) thoracoscopic approaches (aka “microinvasive thoracic surgery”). The role of anesthesiologists in caring for patients undergoing non-intubated or awake thoracic surgery is more challenging than general anesthesia. While thoracic anesthesia already requires specialized skills for initiating, managing and maintaining uni-lung ventilation, the switch to non-intubated patients with either localized anesthesia or conscious sedation adds a new set of complexity to managing these often frail patients. Kiss & Castillo (2015) in their review of the literature, provide an excellent overview of the pros and cons of non-intubated anesthesia as well as guidelines for patient selection and eligibility criteria for use of this technique. Special populations who may benefit from this technique include patients with severe respiratory disease (and a high risk of ventilator dependency with intubation), patients with severe but stable dyspnea, or multiple cardiovascular and respiratory co-morbidities. Kiss et. al also reviews the contraindications to use of this technique including: phrenic nerve paralysis on the non-operative side, patients at risk for difficult intubation, or patients who are unwilling to undergo awake thoracic surgery. Wang & Ge (2014) expand on these complications to include ASA status 4 or higher, bleeding disorders, decompensated heart failure, extreme obesity, unfavorable airway or spinal anatomy as well as specific respiratory conditions including bronchiestasis, asthma, sleep apnea, clinically significant sputum production and strict contralateral lung isolation. Wang & Ge also give specific anesthesia dosing guidelines for conscious sedation, local anesthesia and regional blocks in additional to monitoring parameters. David et. al. 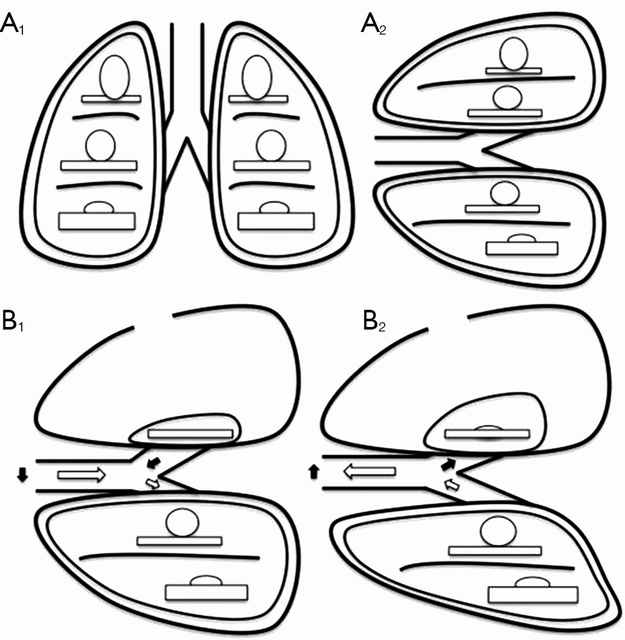 (2015) describe the pathophysiology and alterations in oxygenation and ventilation in surgical pneumothorax including hypercapnia, hypoxia and the associated hypoxic pulmonary vasoconstriction that occurs along with the development of intrapulmonary shunt as the deflated (and unventilated lung) maintains perfusion. The authors also explain how this effect can be either exacerbated or minimized thru the choice of anesthetic agents, and the administration of supplemental oxygen, which further demonstrates the importance of involving the thoracic anesthesia team in preparation for non-intubated cases. This “permissive hypercapnia” has been reported in multiple articles as having minimal to no clinical effects and is easily treated with supplemental oxygen by nasal cannula or facemask. Editor’s note: In advance of this article, Dr. Pompeo, Dr. Gonzalez Rivas and Dr. Min-Hui Hung were contacted for their additional comments and insights on non-intubated thoracic surgery. This and subsequent articles may be augmented, as applicable with their replies. Should we really abandon pursuit of better patient outcomes, faster mobility, recovery and reduced length of stay in lieu of the security to tell off-color jokes with our patients safely under general anesthesia? Should we abandon all hope in treating patients previously deemed inoperable due to our own fears and hesitations to embrace newer techniques and procedures? Ke-Cheng Chen1,3, Ya-Jung Cheng2, Ming-Hui Hung2, Yu-Ding Tseng3, Jin-Shing Chen (2012). Nonintubated thoracoscopic lung resection: a 3-year experience with 285 cases in a single institution. Journal of Thoracic Disease, Aug 2012, 4(4). David P, Pompeo E, Fabbi E, Dauri M. (2015). Surgical pneumothorax under spontaneous ventilation-effect on oxygenation and ventilation. Ann Transl Med. 2015 May;3(8):106. doi: 10.3978/j.issn.2305-5839.2015.03.53. Review. Gonzalez-Rivas D1, Bonome C2, Fieira E3, Aymerich H4, Fernandez R5, Delgado M3, Mendez L3, de la Torre M5. (2015). Non-intubated video-assisted thoracoscopic lung resections: the future of thoracic surgery? Eur J Cardiothorac Surg. 2015 Apr 19. pii: ezv136. article requires subscription, no free full-text available. Nice discussion of the risks of traditional anesthesia and mechanical ventilation in thoracic patients. Gonzalez-Rivas D1, Fernandez R2, de la Torre M2, Rodriguez JL3, Fontan L4, Molina F4. (2014). Single-port thoracoscopic lobectomy in a nonintubated patient: the least invasive procedure for major lung resection? Interact Cardiovasc Thorac Surg. 2014 Oct;19(4):552-5. doi: 10.1093/icvts/ivu209. Epub 2014 Jul 7. Kiss G, Castillo M. (2015). Nonintubated anesthesia in thoracic surgery: general issues. Ann Transl Med. 2015 May;3(8):110. doi: 10.3978/j.issn.2305-5839.2015.04.21. Review. Hung MH, Hsu HH, Cheng YJ, Chen JS. (2014). Nonintubated thoracoscopic surgery: state of the art and future directions. J Thorac Dis. 2014 Jan;6(1):2-9. doi: 10.3978/j.issn.2072-1439.2014.01.16. Review. (Best read in pdf form). Mineo TC, Tacconi F. (2014). Nonintubated thoracic surgery: a lead role or just a walk on part? Chin J Cancer Res. 2014 Oct;26(5):507-10. doi: 10.3978/j.issn.1000-9604.2014.08.11. No abstract available. Very enjoyable, almost conversational article with the authors sharing their experiences with non-intubated thoracic surgery while calling for larger clinical research studies on the topic. Pompeo E, Cristino B, Rogliani P, Dauri M; Awake Thoracic Surgery Research Group (ATSRG). (2015). Urgent awake thoracoscopic treatment of retained haemothorax associated with respiratory failure. Ann Transl Med. 2015 May;3(8):112. doi: 10.3978/j.issn.2305-5839.2015.04.13. Authors review their experiences treating emergent and trauma patients with awake, nonintubated VATS. Pompeo E, Sorge R, Akopov A, Congregado M, Grodzki T; ESTS Non-intubated Thoracic Surgery Working Group. (2015). Non-intubated thoracic surgery-A survey from the European Society of Thoracic Surgeons. Ann Transl Med. 2015 Mar;3(3):37. doi: 10.3978/j.issn.2305-5839.2015.01.34. Pompeo, E. (2015). Non-intubated thoracic surgery: nostalgic or reasonable? Annals of Translational Medicine, 2015; 3(8): 99. Review of the historical development on non-intubated thoracic surgery and techniques in regional anesthesia for complicated thoracic surgery procedures including esophagectomies in the era predating the development of double lumen intubated and unilung ventilation. A timely reminder that some of the greatest developments in medicine and surgery are ‘rediscoveries’ of our predecessors. Pompeo E. (2014). State of the art and perspectives in non-intubated thoracic surgery. Ann Transl Med. 2014 Nov;2(11):106. doi: 10.3978/j.issn.2305-5839.2014.10.01. Nicely written article. Has link to video presentation for purchase. Pompeo, E. (2014). Non-intubated vodeo-assisted thoracic surgery under epidural anesthesia – encouraging early results encourage randomized trials. Chinese Journal of Cancer Research 2014, 26(4); 364-367. Pompeo E, Dauri M; Awake Thoracic Surgery Research Group (2014). Is there any benefit in using awake anesthesia with thoracic epidural in thoracoscopic talc pleurodesis? J Thorac Cardiovasc Surg. 2013 Aug;146(2):495-7.e1. doi: 10.1016/j.jtcvs.2013.03.038. Epub 2013 Apr 17. No abstract available. Pompeo E; Awake Thoracic Surgery Research Group (2012). To be awake, or not to be awake, that is the question. J Thorac Cardiovasc Surg. 2012 Jul;144(1):281-2; author reply 282. doi: 10.1016/j.jtcvs.2012.01.083. No abstract available. Comment on article by Noda et. al. Pompeo E, Mineo D, Rogliani P, Sabato AF, Mineo TC (2004). Feasibility and results of awake thoracoscopic resection of solitary pulmonary nodules. Ann Thorac Surg. 2004 Nov;78(5):1761-8. One of the earlier modern publications on awake thoracic surgery. Tacconi F, Pompeo E, Mineo TC. (2009). Duration of air leak is reduced after awake nonresectional lung volume reduction surgery. Eur J Cardiothorac Surg 2009;35:822-8; discussion 828. Wang B, Ge S. (2014). Nonintubated anesthesia for thoracic surgery. J Thorac Dis. 2014 Dec;6(12):1868-74. doi: 10.3978/j.issn.2072-1439.2014.11.39. Review. Related table: the advantages and disadvantages of nonintubated anesthesia for thoracic surgery. Note: This is not an exhaustive list of literature available on this topic but a select listing of the most recent and relevant citations (and are available as free full text). **Long time readers of thoracics.org may have noticed that we no long cover or report on ‘debates’ or discussions as to whether VATS can be used in oncology cases, or whether an adequate lymph node dissection can be performed using VATS. The literature clearly demonstrates that it can – and clinical guidelines reflect this, making the discussion one-sided, tedious, out-dated and repetitious.